GriefShare is a recovery support group for those grieving the death of a close family member or friend. It is designed to help you restore hope and to begin rebuilding your life and future. Our group has a leadership team of people who have experienced significant losses themselves and understand the confusion, isolation and deep loss you are experiencing. They offer a caring, safe environment as they come alongside you and walk with you toward finding a new normal and restored joy. Each GriefShare session is self-contained, so you are welcome to begin at any time and do not have to attend in sequence. You will find encouragement and help whenever you begin. (1) Video Seminar — Group members watch a video each week featuring top experts on grief and recovery subjects. These videos are produced in an interesting television magazine format featuring expert interviews, real-life case studies, and dramatic reenactments. (2) Support Group Discussion — After viewing the video, group members spend time as a support group, discussing what was presented in that week’s video seminar. (3) Personal Study and Reflection — During the week you have the opportunity to use your workbook for further personal study of the grieving process and to help sort out your emotions through journaling. 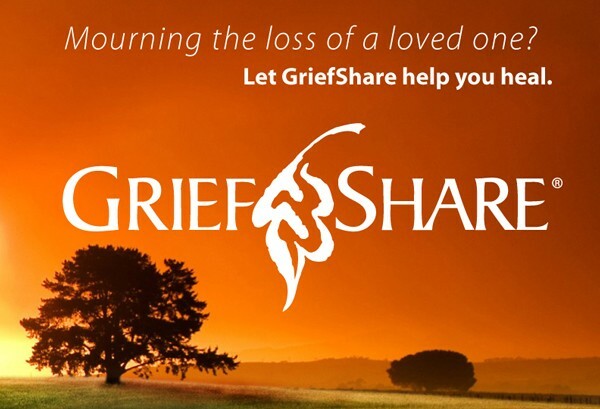 GriefShare is for people grieving the death of a close family member or friend. That loss may have occurred months or even years ago and you feel like you’ve never fully worked through the grief process. You will quickly feel comfortable and accepted in your GriefShare group and discover there are others who have the same kind of feelings you do and understand the hurt you feel and the loss you have experienced. While things may look bleak now, you’ll learn ways to restore your hope and rebuild your life.Most GriefShare alumni tell us the program helped them move from deep grief to peace and a sense of joy again.